Otherwise known as a pressure regulating valve or pressure reducing valve, this large, cone-shaped brass valve is located on your incoming main water line, most of the time inside the home. You may never have seen this valve if you have a crawlspace or a finished basement, but rest assured, it’s there (or should be). The function of a PRV is to regulate the water pressure inside your home’s plumbing between 55 and 70 psi. The water pressure on your main waterline before it reaches your home, and subsequently your PRV, is around 130-160 psi. This is far too high for your faucets, toilet valves, and other plumbing fixtures to handle. This amount of pressure would damage the components in these items, causing faulty operation and leaks. So in order to keep the water pressure at a safe working level, a PRV is installed to reduce and regulate the pressure at a consistent range, extending the life of your plumbing system. They accomplish this by using an internally mounted spring and diaphragm assembly that controls the pressure by channeling the water through multiple chambers. Imagine the muffler on your car…only a little more complex. Like any other mechanical valve, PRV’s have a relatively limited lifespan. Their total working time is dependent on several things, including street pressure, usage, and overall quality, but the average lifespan of one of these valves ranges from 7-12 years, with some exceptions. PRV’s can be easily damaged, however, and often you will notice pressure issues in your home after only a few years. Small bits of debris can find their way into waterlines, damaging or clogging the mechanism that controls pressure. The internal diaphragm, being made of a softer material, can be torn if debris enters the valve. This event will often cause a humming or banging sound coming from your water pipes, known as water hammer. High quality valves are less prone, but still susceptible to these problems. Some brands and models have a longer lifespan than others, and we only install the highest quality, proven valves in your home. 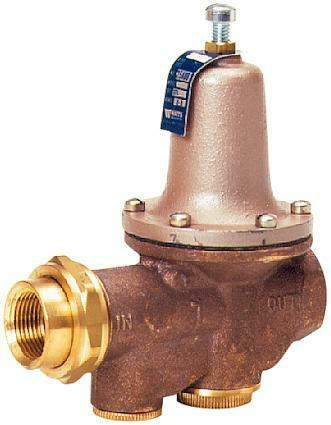 These valves range in size from 3/4″ to 1 1/2″ for residential applications, and even larger for commercial properties. Twin Plumbing installs and services all types of PRV’s. So when you notice a sudden increase or decrease in your water pressure, strange sounds when you use faucets or flush a toilet, or if it’s simply been a while since your last replacement, have your PRV replaced. It will save you costly repairs elsewhere in your home and keep your plumbing system in check.